Practical and pleasing: Using patterns in your patio and walkway design. - Pine Hall Brick, Inc.
15 Nov Practical and pleasing: Using patterns in your patio and walkway design. Pavers are a durable and long lasting option when it comes to building a patio or walkway. Unlike wooden decks that need constant upkeep and poured concrete that often develops cracks, pavers are also extremely low maintenance. Don’t be fooled by their workhorse reputation as a building material, though, pavers are also one of the most beautiful investments you can make in your home. By using multiple colors, you can create interesting patterns that draw the eye. The design above uses concentric diamonds to lead you into the building and to the benches on either side. The diagonal lines allow the eye to follow a longer path and help to make this small space seem larger. Even without using different colors of pavers, you can create an elegant look with patterns. The stack bond helps separate areas in your patio or walkway. The design above, by Landscape Plus Design out of Illinois, uses stack bond to delineate borders and a change of materials. The herringbone pattern, pointing down the walkway, leads visitors forward. It also helps to integrate the diamond pattern created by the stone inlay. 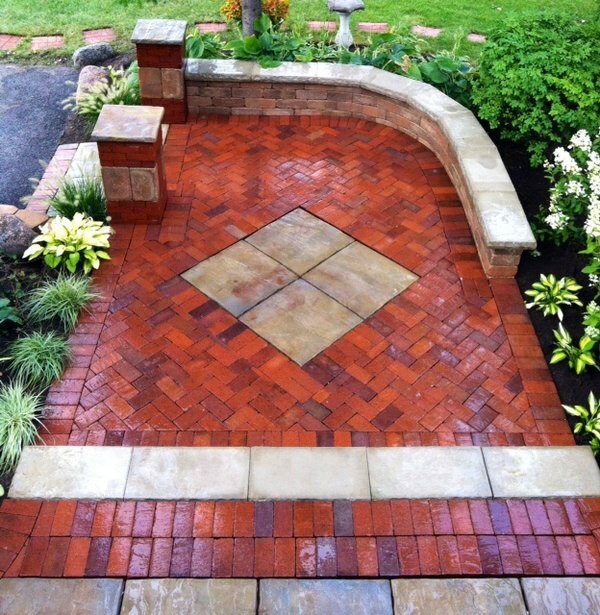 For more paver pattern inspiration, visit PineHallBrick.com.